Hi everyone! First of all, welcome back to my blog. 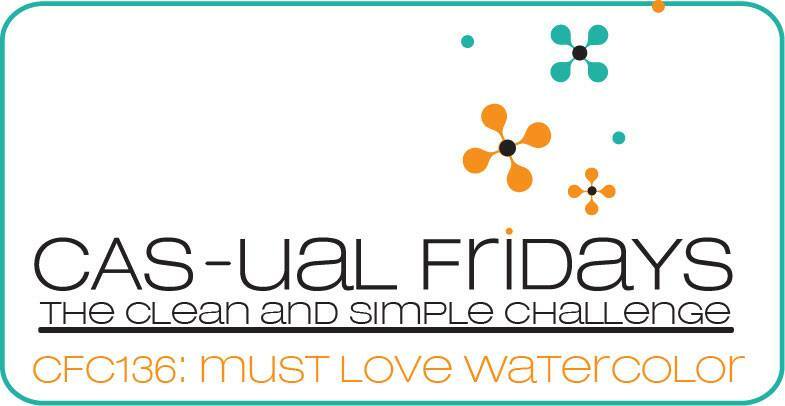 I'm currently in Germany right now but I'm still excited to share with you a new challenge for CAS-ual Fridays! For this month, the challenge is to use watercolour with a love theme to your card. I know many of you out there have tried watercolouring and probably love them. If not, here's your chance! I've basically took a border stamp and stamped it multiple times to create this background on a watercolour paper. After I've heat embossed it in white, I pressed some distress ink colours to create a random wash of watercolour background. This is really easy to do and you can use any colours you want. and which part of Germany are you..I am in Munich..if you visit Munich please reply my comment we can meet for a coffe or making card together at my home.you are welcome to visiting me Marina.. This is soooooooo beautiful! Love your creativeness with the heart! WOW! This is just super cool watercoloring! Beautiful card!